Here we are in the beginning of our fourth year as a school. 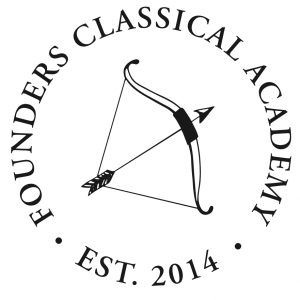 It is a joyful time to be associated with Founders Classical Academy. As I walk the halls and visit classrooms each day I am filled with pride in our students and our community. I am teaching Literature IV to the class of 2018, and these impressive students, who will be the first to complete the high school curriculum in its entirety, are a testament to the good that can come from classical education. We have come so far in just a few short years, and thinking about the future is exciting. Last month our partners at the Barney Charter School Initiative visited our school to observe classes, mentor our teachers, and talk with me, Mr. Sowers, and Ms. Loy about our goals for this academic year. I thought you would enjoy hearing some of their comments. I am so proud of the way our students approach their studies, and I am grateful for the work of our talented teachers and staff in forming this culture of genuine curiosity and learning. This is the first thing to get right, and it’s a precious thing to preserve. But, let’s not rest on our laurels. There is a lot of work still to do, and as a faculty we are using this year to refine and improve the art of teaching. Becoming a teacher is a lifelong pursuit and I hope that our school will continue to be a long-term home for teachers who want to hone their craft. We are making sure not to miss moments for discussion and explanation in the classroom, and we are working hard to bring our new students–160 of them!–along in the curriculum. Our work is exciting work, and it’s important work. I am grateful to be alongside you as we strive together.